Neat shot of the Woolworth's Cherry Hill Grill restaurant outside of Woolworth's (where else?) in the Cherry Hill Mall! I think we all have fond memories of these great old greasy spoons so typical of shopping malls back in the day. I know I sure ate my share of cheeseburgers and fish platters from them! The cafeterias in Kmart were a family favorite, too, for the Milford clan growing up. Very similar to the Woolworth joints actually. I especially loved their grease-laden egg rolls and their butterscotch pudding (Kmart), while my dad was nuts about their apple dumplings. And I do mean nuts about them! 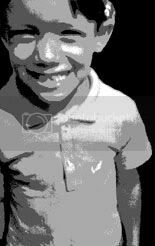 I never saw the attraction myself (at least at that age). It's hard to imagine (now) we ate meals in Kmart, but we did. I ate my first grill cheese sandwich at a Walgreens (as part of a complete meal, french fries, etc.). Man, I had almost forgotten the sublime pleasure of a Kmart ham-and-cheese sandwich -- sliced canned ham (with gelatin remnants), American cheese and shredded lettuce on a hamburger bun, pre-wrapped for your convenience. I ate at Woolworth's in downtown Atlanta once, and I have vivid memories of Kmart's submarine sadwiches. The classic food in this type of restaurant had something of a special taste to it that's not found in today's world. I have to admit, however, that I wasn't so impressed with the Kmart eateries. I do have fond memories of meals at Montgomery Ward at Randhurst (Mt. Prospect, IL) and at both Penneys and Sears in Tulsa, OK. It's been a long time since I've had a meal in a genuine department store restaurant. Last that I recall was many years ago at Nordstrom at Mongtomery Mall in Maryland. I know I do. I think the Woolworth's that once existed at the Woodville Mall near Toledo had a separate restaurant next door to it's location you could either enter from inside Woolworths or from the mall itself. The Woolworth's near me (Miracle Mile Shopping Center) had a regular coffee shop-type counter. I only wish my Kmart had that again, and not the little dinky eatery they have near the entrance these days. I loved eateries in a mall with seating featured on this postcard. I wish they did that more often. Now we are stuck with a food court and common seating. I can remember many lunches with my grandmother at Woolworth's restaurants. This was before I entered school and she used to babysit. Weren't some of them called "Harvest House"? All I can remember are grilled cheese sandwiches, or sometimes we would just share an ice cream sundae or something. Back in those days, many places like this would have a big bouquet of balloons. You picked a balloon, and the waitress would pop it. Inside would be a little slip telling you how much your banana split would be. Usually it was only a few cents off, like $1.20 when the regular price was only $1.29, but it was still fun! I do miss these old kinds of places, which were convenient and tasty, and you got proper service from a real waitress, and the food was served on real plates and glasses with real silverware. You people are all crazy! The food at these places was TERRIBLE. (I was a child of the '70s, so I was there, too, stuck in a booth seat at the K-Mart Kafeteria, in the midst of its wood-grained hell.) All this nostalgia (and toxic cuisine) has softened your memories. 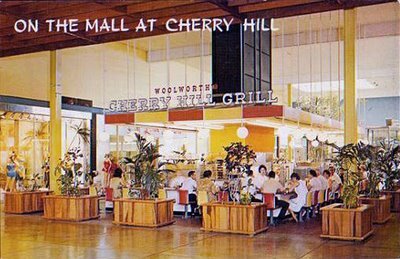 My mom used to take us and eat at the Cherry Hill Grill in the Cherry Hill Mall (one of the first indoor malls in the world). Funny thing is, we used to think that all the people who worked there were "midgets". The inside of it was sunken down about 3 feet and so the waitresses looked like little people. Does anyone remember the large cafeteria attached to the Cherry Hill Mall woolworths in the 70's? It served typical fare: mac & cheese, turkey w/gravy, etc. Also, there was a walk up snack bar with those pina-colada whipped drinks. Strawbridges had a great restaurant that overlooked the Malls main fountain. I always felt so ritzy when my mom took me there. Does anyone remember the large cafeteria attached to the Cherry Hill Mall Woolwoths back in the 70's? It sold typical cafeteria fare. Turkey and gravy, mac and cheese, etc. Also, there was a walk up snack bar with those yummy pinacolada whipped drinks. Oh my goodness, the cherry hill grill. Thank you SO much for the incredible post cards of the Cherry Hill Mall. I was there almost weekly throughout the 1960's and it has brought back so many memories of that place and time. Yes, the restaurant attached to the Woolworths was call "Harvest House" (actually a cafeteria). I've been around a lot of years, and a lot of places, and nothing can compare to the design, layout, and atmosphere of the Cherry Hill Mall. My wife and I have now planned a stop on our vacation this month to visit once again -- however changed it may be. Thanks again. in 1988,'89. It was a really fun place to work and the food was great too. I was a busboy and when no one was looking, i'd go to the back and wolf down a fistful of bacon. there was an endless supply of it. The place was demolished in the early 90's and the space still sits vacant. kinda makes me sad when I think about it. I ate hamburgers and french fries at Woolworths in the late '60s as a small child. As a teen in the late 1970s I was already nostalgic for Woolworths and thought it was very 1960s-ish and was eating there again. Last time I ate in a Woolworths was in 1987 and the last time I shopped in a Woolworths was about 1997. Too bad the chain didn't convert to dollar stores so it could survive. Zayre had a restaurant in it too that I ate at a few times too. These were chilled out times and chilled out places to eat unlike the chaotic food areas at Targets or Walmarts. Wow...this brings back memories!!! I work there as a kid in the 70's.. I grilled, fried, and scooped ...tuff job @ 16.. but I'm still in the food business...those were the days! Kmart subs were the best ! I remember eating in a Gold Circle in Cincinnati as a kid. Northgate Mall used to have a restaurant in one of their anchor stores. It was on the second floor overlooking the center part of the mall. Tres chi-chi! Does anyone remember a village inside the Cherry Hill mall that was for kids and you walked thru it? I can picture it, but don't remember the name of it. This place is actually still there. I'm sitting at the counter right now. It's now called the Bistro. It's remodeled a cpl of times. The 3 planters are gone and there are now tables and chairs for more ppl. Food is still great.